Precedent Furniture is located in Hickory North Carolina. Precedent's success has extended over three decades, by making quality furniture at a wonderful value. 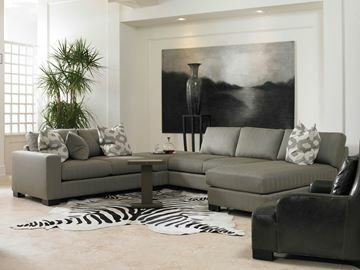 Foster's Furniture began a wonderful relationship with Precedent in the early 1990's. Since our early days in working with them, and to this day, we've always been impressed with their consistency, diligence, and pride in craftsmanship. We hope you enjoy shopping their offerings, and please email, call, or come see us if you'd like more information. 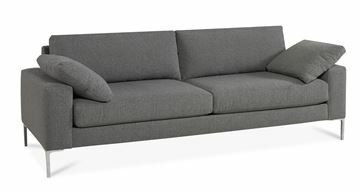 The Alexis Sofa by Precedent Furniture. 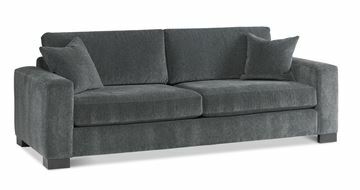 The Alexis is a plush sitting soft contemporary design. The medium width track arm showcases exceptionally well with the brushed metal legs. The Alexis Sofa is available in a wide variety of fabrics, making it a simple and enjoyable task to find the perfect fit your room. The cushions are plush and very comfortable. There are several options for the cushion filler, which greatly influences the look and comfort style of the finished sectional. The cushions are not attached to the frame, making it easy to flip and rotate for maximum longevity. Please see below for all the available choices, and please call or email us for help making the perfect configuration. We love to help, and we'll gladly do so as much, or as little as you want us to. The Marshall Sofa by Precedent Furniture in Hickory, North Carolina. The Marshall features generous track arms, and supportive cushioning. The seat cushions and back cushions are not attached to the frame. Comes standard with two accent pillows.